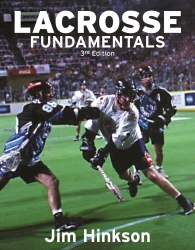 Jim Hinkson's books have become the standard guides to one of the fastest-growing sports in American–box lacrosse. players and coaches how to master the basics of catching, cradling, passing and shooting the ball; loose ball strategies; individual offense and defense techniques; face-off techniques; and goaltending. Simple, straightforward instructions are accompanied by photos and illustrations. Hinkson draws on his extensive coaching and playing experience to give valuable tips for developing the physical and mental skills necessary to become a top-notch player. Instructions are presented simply enough for the new coach to grasp, and provide ample ideas and challenges for the more experienced coach and player. Jim Hinkson is a well known expert in lacrosse circles and gives frequent coaching clinics across North America. He is also the author of Lacrosse Team Strategies, and The Art of Team Coaching, and co-author of Lacrosse for Dummies (IDG). He was also a coach with the New York Saints of the National Lacrosse League.He lives in Toronto, Canada.